This class offers everything from the proper use of tools (letting your tools do most of the work), to discussions about wire gauges and wire properties. 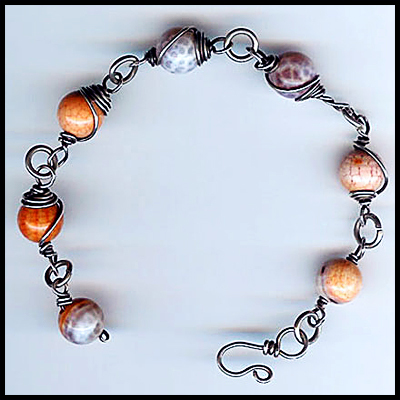 You will learn how to cap beads and how to make ear wires, eye pins & head pins. You'll leave with a completed bracelet (including toggle) and you’ll be able to proudly say “I made it myself!”. Kits (which include semi-precious stones plus practice wire and sterling silver wire) will be available. Kit Includes: 20g. & 18 g. Copper & silver wire, semi-precious stone, pro polishing & anti-tarnish pads, Ruler & much more! Teacher Provides: tools to share. Things to bring: if you have wire working tools I.E. : round nose, flat nose & chain nose pliers. Side cutters, hammer & bench block. Not to worry if you don't own these , I will share my tools!